This is an article about Gordon Weston, a man who is a relatively new customer and now friend. Gordon does amazing work that effects so many people and it is for that reason we wanted to help share his story. 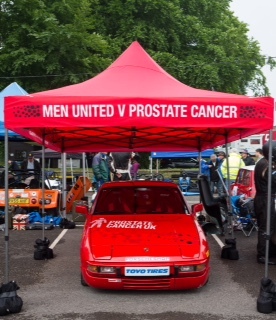 I have been competing in Motor Sport since April 2016 and using my specially sign written Porsche 924s to raise Awareness in Prostate Cancer. I am 69 years of age and in Remission from Prostate Cancer due to early diagnosis? Motor Sport as it’s very much a male oriented past time and has a big following from the target age group who Prostate Cancer UK wants to reach to raise awareness in this little publicised disease. There were over 10,500 deaths attributed to Prostate Cancer last year. In 2010 it came as a shock when a very close friend informed me that having been diagnosed late with prostate cancer, his future was not good and he asked me to promise to go and see my GP and have a male MOT. I was found to have a slightly PSA and I was closely monitored. In 2013 my PSA had risen again, and an MRI indicated that I needed a biopsy and in 2015 I was diagnosed with Prostate Cancer. Thankfully I was put in the hands of one of the top specialists in this field – Professor Stephen Langley at the Royal Surrey Urology Department and after a bout of radiotherapy I underwent Brachytherapy which proved a success – Anyone who rubbishes the NHS needs to know that I received the very best care, and here I am now. I had acquired some 4 years ago a Porsche 924, having bought it at auction on a whim. I had no idea what I wanted to do with her and as a result she sat in my garage throughout my treatment being somewhat neglected. It’s fair to say that when you go through something like this and come out the other end, you start to reassess what is important. I was retired, had seen my four children grow up and was now looking at hopefully a fair stretch ahead with fewer responsibilities. 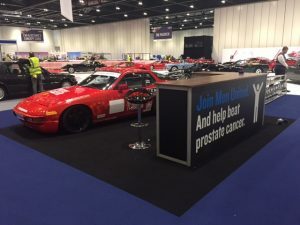 I was certain that I wanted to make more men aware of prostate cancer, particularly because this is not necessarily an old man’s illness, but I was unsure how I could make a difference. Whilst I was tinkering in my garage it came to me. As a younger man, before I had children, I used to race and I loved it – staring right at me was this Porsche 924. A Porsche that in theory with a bit of love I could take out to race in and one that I could use to raise awareness and much needed funds for Prostate Cancer UK. A crazy idea? Not so crazy! 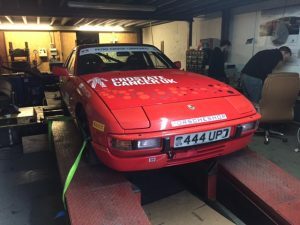 This is where I am now, supporting Prostate Cancer UK I have entered the BARC South West hill climb championship and the Porsche Club GB speed championship. I am doing this on a very tight budget, my only sponsor currently being Toyo Tyres, who have been very generous. And more frightening 1 in 4 Afro Caribbean men – and if it’s already in their family, things don’t look good at all.